One of the great things about fundraising is that there are so many ways you can do it. Alone or in groups, simple or complex - all of these fundraising methods can lead to success. You can even get your family involved in fundraising. Fundraising with your family is a great option for several reasons. Not only will you receive encouragement from your loved ones (and support them in return) but you'll also be accomplishing something together. It's a great feeling! Sponsored activities are very popular because you can choose a task that suits you. People have had success doing a wide variety of sponsored fundraising tasks, including swimming the English Channel, abseiling and cycling across the country. But sponsored activities can be simple, too. Giving up something you love is one of the most popular sponsored activities. Your family can give up anything, such as tea, chocolate or watching TV. You can even give up something you normally do as a family, like a weekend takeaway or a night out, and contribute the savings to your fundraising efforts. No matter what sponsored activity you do, try to get as many people involved as possible. You can ask for donations at work and school, from friends, family and businesses, and you can contact your local media too. You can even ask for donations on the Internet. The more attention to you can raise to your sponsored activity, the more funds you'll raise for your cause. No, we're not talking about selling your little brother to the neighbours. Instead, clean out the house of unwanted items and raise some money for your fundraising cause with a family auction. Ask each member of your family to find 5-10 things they no longer want (items should be in good, saleable condition). Then, run an online auction, or spend the weekend hawking your wares at a car boot sale. The money you raise will go straight to your charity or organisation, and your house will be cleaner too! 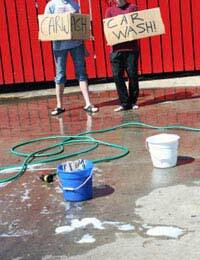 Doing odd jobs around the neighbourhood is another great way to earn money for your fundraising cause. Spend a weekend doing work in your community in exchange for a donation. Get creative with your ideas and you'll be able to make lots of money. Even younger members of the family can get involved by doing simpler tasks or favours, such as raking leaves or running to the corner shop to buy milk for a neighbour. Getting started with family fundraising is easy. Get your family together and decide on a fundraising plan. Discuss how involved each person would like to be, and be sure to find important roles for the younger members of the family too. Remember: there are so many different ways to fundraise, but you have to get started to accomplish something!